Blood is a tissue.An adult has a blood volume of approximately 5 liters. •Blood is the only tissue that exists in both the liquid and solid state simultaneously. 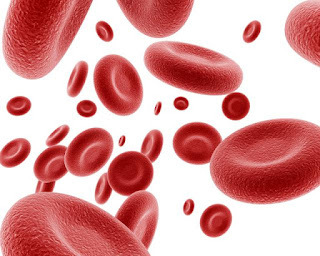 •Mature RBC's are found in the blood vessels. They have no nucleus. Destroy harmful viruses and bacteria (pathogens) and help remove dead pathogens and body cells from the body. •WBC's rid the body of pathogens in the process of phagocytosis: the WBC surrounds, engulfs and "eats" the invading pathogen. Cell fragments that aid in the formation of blood clots. Blood clot:Dried blood that has formed a plug over a wound to slow and eventually stop bleeding. 1.When an injury occurs, platelets are ruptured. 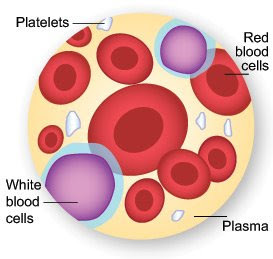 2.Ruptured platelets release a protein called thromboplastin. 3.Thromboplastin reacts with calcium and another protein (in the plasma) called prothrombin.The result of this reaction is a new protein called thrombin. 4.Thrombin then reacts with another protein found in the blood plasma called Fibrinogen.The result of this reaction is another new protein. This one is called Fibrin. 5.Fibrin forms long, thin strands that form a net over the wound.RBC's become trapped in this net, and because they are exposed to air, they dry out.The dried,RBC's first form a clot, then dry into a scab that prevents further blood loss. There four different blood types in the human population. •Antigens and antibodies of the same type will bond with each other. This causes the blood to thicken and become gelatinous in the blood vessels. This process is called agglutination. •Antigens and antibodies of different types will not react with each other, because their shapes are different. Note:Type AB has both types of antigens on its RBC's, but does not have the capability to produce antibodies of either type, no matter what antigen is present. This inability to produce antibodies makes Type AB the universal recipient. A person with Type AB blood can receive any blood type, however, they would respond best to Type AB blood. 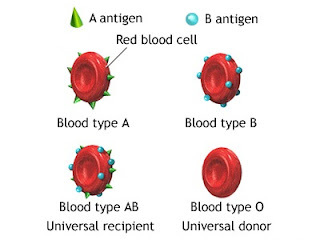 Note:Type O does not have any antigens on the surface of its RBC's, but it can produce antibodies to bond with either the Type A or the Type B antigen, should either be introduced into the body. 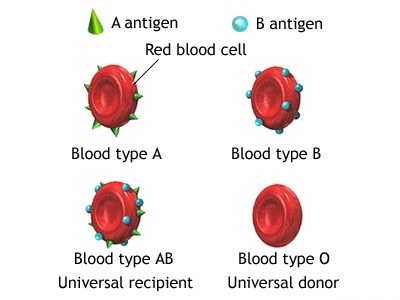 Because Type O can produce antibodies to both antigens, Type O blood can only be mixed with Type O blood, but since Type O RBC's carry no antigens on their surface, they can be mixed with any other blood type with no risk of agglutination. This makes Type O the universal donor.